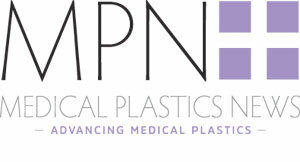 The continuous improvement strategy towards cost-effective, lean production for medical plastics, comes with an explicit requirement for innovation and scalability for today’s manufacturing facilities. In looking to increase its manufacturing capability offering with cleanroom production, Tex Plastics’ technical & quality director, Andy Clarke and manufacturing director Dave Kearney, used the services of Connect 2 Cleanrooms. Tex Plastics says its mission to develop higher performing, lower cost solutions for its clients, has been boosted by a class 7/8 cleanroom system that includes automated clean-air HEPA-lite canopies. When considering injection moulding processes, the tool face of the machine is often the most exposed area of the production line and this is the area which often requires the supply of controlled air. A simple way to achieve this is to enclose the full machine in a cleanroom; however this brings inevitable challenges of managing tool changes. Enclosing the machine, mould and crane creates a large environment in floor space and height. This approach leads to a vast amount of air being unnecessarily processed, negatively impacting on attempts to reduce carbon emissions. It also increases the risk of contamination and safety issues as the overhead crane inevitably retains particles and cleaning it is a cumbersome and difficult task – not to mention the hopper creating a mass of contamination within the cleanroom. According to Connect 2 Cleanrooms, a more cost-effective and energy efficient option is to create a modular cleanroom on castors, that can be wheeled away to provide aerial crane access. While this low-cost solution is a practical solution for many, it creates downtime as machinery requires a full clean down following exposure to the external manufacturing environment. This increases the risk of contamination and reduces the ability to offer a timely response to customer schedule changes. Manufacturing and production staff have been working around or compromising on these issues for years, but Connect 2 Cleanrooms R&D team has developed a solution with an automated canopy system for its cleanrooms. Through an intuitive user-friendly touch screen interface, Tex Plastics is able to remotely activate actuators that slide sealed HEPA-lite canopies back in the ceiling of the cleanroom, to allow overhead crane access to tooling. This customer driven requirement ensures that clean air is supplied at the critical point of production and reduces contamination by significantly limiting the areas of machinery that are exposed to the external environment during tooling changes. This limits downtime for cleaning, reduces risk of contamination and increases productivity. The canopy is a bespoke unit, containing a MAC10XL HEPA filter – fully sealed to facilitate the re-circulation of the cleanroom’s air conditioning. ULPA filtration is also able to be inbuilt for those users looking for higher cleanroom classifications. An LED warning beacon above the control panel visually indicates when the canopy is open, reminding operators to close the canopy, prior to new batch production. This innovative and market leading cleanroom solution, features LED strip lighting around the underside of the canopy for extra lux levels, illuminating the tool face for operators. The touch screen interface also acts as a control system, allowing full control of HEPA filtration and lighting levels, as well as monitoring pressure levels and alerting staff if the cleanroom is operating out of specification. All of the pressure data is logged, exportable and auditable, to demonstrate performance and continued compliance of the production processes. There are four zones inside Tex Plastics’ cleanroom separated by partitions – two housing Arburg injection moulding machines, a packing area and a goods transfer area. If one machine needs decommissioning or servicing, this can be achieved safely without affecting any of the other processes. The modular design means that additional space can be added to accommodate more machinery or create a larger packing area. This gives clients the peace of mind that scalability and future capacity is achievable when required. Tex Plastics supplied 3D models of its machines allowing Connect 2 Cleanrooms to maximise on floor space when designing its cleanroom and ensure a seamless installation programme with minimal disruption to Tex Plastic’s production team. The cleanroom is now fully operational, completing the ‘concept to completion’ project solution for all conventional, white room and cleanroom thermoplastic requirements.